If you’re a returning visitor to our site, you may notice things are just a little bit different. We’re excited to show you the new and improved content we have to offer. If you’re new to ClearRisk, welcome! We hope you find our site helpful. We've been working on this project for several weeks, and our whole team has gotten involved. We're very excited to share our new content and features! We are now updating our website with new case studies. The City of Saint John is available now; click here to learn how ClearRisk saved them $300,000 in claim costs (that’s 50% of their annual total!). Also available is Universal Parking: read now to find out how ClearRisk's centralized database and online submission portal resulted in an 88% decrease in time spent per claim and a 48% decrease in claim costs. There are additional case studies underway on everything from our implementation process to the new initiatives risk managers have been able to take on since ClearRisk made their lives easier. Keep checking back to hear the latest updates from our customers. 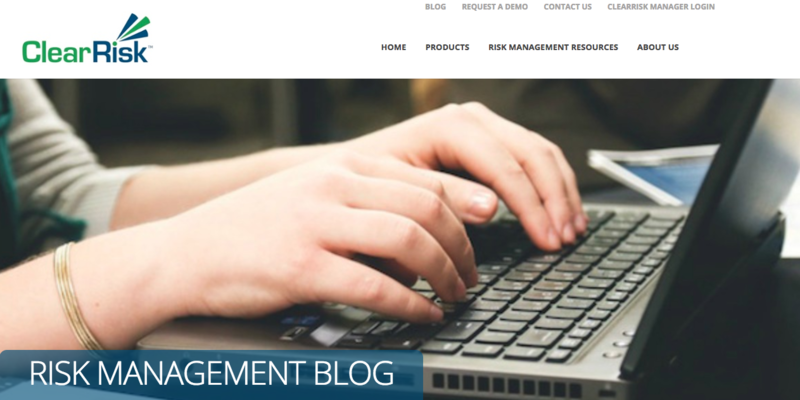 We've updated the look and feel of our risk management blog. Come subscribe to receive the latest trends in insurance and risk management delivered directly to your inbox. We're excited to now be offering opportunities for guest bloggers to be featured on our site. If you have an idea you'd like to pitch, please contact us. We'd love to hear from you and help educate our readers! Our old website didn’t do justice to the product roadmap that ClearRisk has developed over the last number of years. Our system is fully customizable, and every customer has something unique to bring to the table. If our platform is missing something, we’ll build it just for you. This constant development has allowed us to create a number of modules that we now offer individually or as one within a larger system. Our new site details each product and module that ClearRisk has to offer. Expedite organizational claims management with automated processes and customizable workflows, providing the ability to streamline those tedious, time-consuming processes and increasing the effectiveness of reports. ClearRisk’s platform has been proven to uncover high-risk areas, pinpoint root causes, and have a dramatic effect on reducing organizational total cost of risk. Our customers have reported average annual cost reductions of 49% while reducing internal effort by 75%. For more information, click here. Incidents are the number one predictor of claims, and tracking them can allow you to implement preventative measures. Identify the root cause through trend analysis and significantly reduce the probability of a future claim. Interested? Learn more! Designed by fleet managers, this module brings effortless automation and reporting that eliminates time-consuming manual work and lowers costs. Check out our fleet page for more details. Insurance can be complicated, but managing it shouldn’t be. Our certificate module tracks all third parties and payment information in one place and sends you notifications when expiry is near. Read more about our insurance module here. Tired of submitting long, complicated forms when something goes wrong? Our online web portal eliminates manual data entry by allowing any employee to enter an incident from any internet-enabled device. Data is automatically uploaded into your system and relevant parties receive automatic notification emails. Learn more here. This product is built for insurance brokers looking to add value and differentiate themselves from competitors. Risk maps, industry risk lists, mitigation guides, and other tools that will help you gain and retain clients are at your fingertips with ClearRisk Manager. We encourage you to explore our new site. 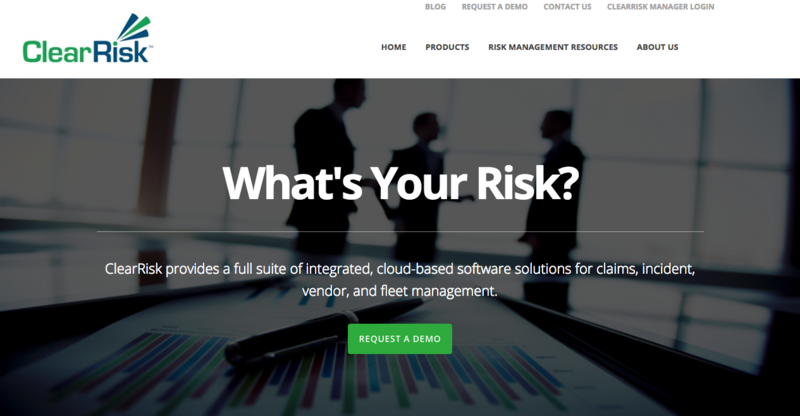 We're confident that ClearRisk has the perfect risk solution for you and your organization. If you have any suggestions or feedback, please let us know!